Tibetan Juniper Incense Sticks are traditionally hand-rolled from natural herbs, oils and other ingredients. Particularly suitable as an offering to the Dharma Protectors, juniper is also prized for its healing, calming and purifying properties according to traditional Ayurvedic practice. Tibetan Juniper Incense Sticks are traditionally hand-rolled from natural herbs, oils and other ingredients. One of the most popular incense ingredients in Tibetan Buddhism, juniper has a distinctive sharp aroma and is particularly suitable as an offering to the Dharma Protectors. In Ayurvedic practice, juniper has an important role in the treatment of many contagious diseases. It clears, stimulates and strengthens the nerves, purifies the atmosphere and has a calming effect for the overstressed. It is also known to be helpful to alleviate pre-menstrual symptoms. Tibetan Juniper Incense cleanses and purifies the environment of unwanted energies and aids relaxation and stress-relief. It is also particularly used during spiritual ceremonies and meditation sessions to create a peaceful and calm atmosphere. Buddhists also offer incense to purify what has been offered on the altar and to create the causes to have morality, ethics and hold one's vows well - virtues of the Bodhisattva spirit of selfless altruism to benefit others. Hence it is strongly encouraged to offer the best incense (and by extension, the best offerings) that one can afford. 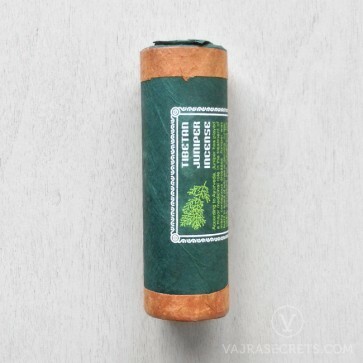 These natural incense sticks are non-toxic and safe for inhalation. Includes a complimentary incense holder. For the best experience, burn in a Tibetan-style incense burner.